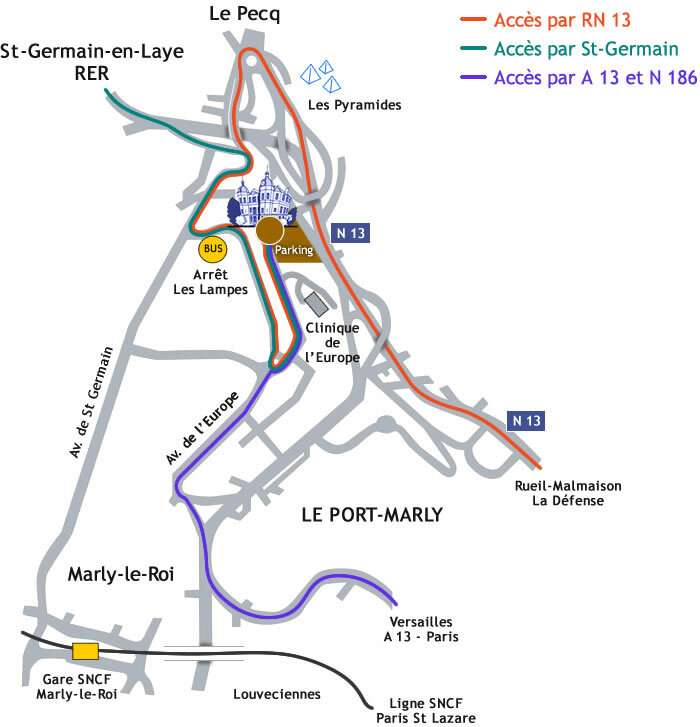 Take the high speed rail transit to Saint Germain en Laye, then the number 10 bus towards “Les lampes” (avenue de l’Europe), getting off at Avenue Kennedy. Take the first turn on the right (Chemin des Montferrand) and follow the footpath to the Château. Approaching from the A13: exit at Saint-Germain-en-Laye N186, heading towards Saint Germain en Laye. At the 5th set of traffic lights, follow the left hand lane towards Marly le Roi. The Château shares an entrance with the Clinique de l’Europe, following the path at the top of the Ormes. The car park has an automated gate. Ring for entry. Approaching from the A86: A86 – N13 towards Saint Germain en Laye – D186 then D7 towards Marly le Roi – after entering at the gate to the Château de Monte-Cristo, take the second on the left into avenue de l’Europe. Follow the avenue until the roundabout, then take the shared entrance signed towards the Clinique de l’Europe to the top of des Ormes (Marly le Roi). There is an automatic gate at the Château entrance. Ring for entry. 50 spaces close to the castle reception. There is an automatic gate: ring for entry. There are no parking facilities for coaches. Group organisers receive a map showing the drop-off point for coach parties when they reserve with the Marly le Roi tourist office.